Edmunds Inside Line got their hands on a Nissan GT-R Spec V to test. Check out the test, pictures, and videos over on Inside Line. Sitting here on the asphalt at Tochigi, the 2009 Nissan GT-R SpecV looks more menacing than the standard GT-R. It wears $5,900 in optional Ultimate Black Opal paint (a shade of deep purple), as well as a grille, front brake ducts and rear wing made from lightweight carbon fiber. The forged-aluminum 20-inch wheels by Rays Engineering also reduce weight. To shed further pounds, Mizuno also directed the removal of the two tight-fitting rear seats, replacing them with soft plastic covers. The Recaro seats up front are built up from thin carbon-fiber shells to reduce weight as well. All told, the SpecV lost 132 pounds, dropping its curb weight to 3,704 pounds. To tell the truth, though, we really had hoped as much as 220 pounds could have been dropped from the bottom line. 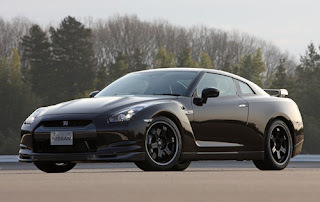 he 2009 Nissan GT-R SpecV takes off instantly with virtually no tire spin, and the car catapults to 60 mph from a standstill in 3.7 seconds (3.3 seconds with 1 foot of rollout), while the quarter-mile flies by in 11.5 seconds at 124.2 mph. This compares with our recent retest of our long-term GT-R with its new Nissan-mandated recalibrated VDC switched on, which gets to 60 mph from a standstill in 3.6 seconds (3.4 seconds with 1 foot of rollout) and makes its pass through the quarter-mile in 11.7 seconds at 118.5 mph.